FIGURE 2.21. 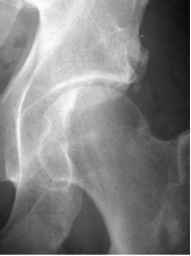 A 46-year-old man with residual pain, 18 months following closed treatment of a posterior fracture dislocation of the left hip. (A) AP radiograph reveals a concentric reduction with evidence of bone fragments around the joint (arrow). 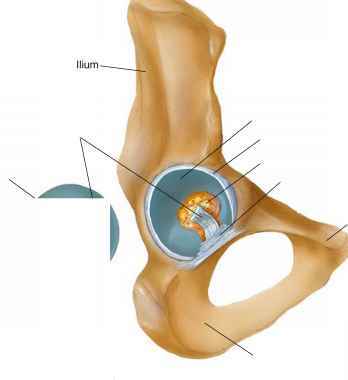 (B) CT scan demonstrates two large fragments (arrows) posterior to the joint impinging on the femoral head. (C) Arthroscopic view from the anterior portal looking posteriorly reveals that the fragments reside outside the joint, obscured from view by the overlying healed capsule (C) and scar that is evident between the posterior acetabulum (A) and the femoral head (F). (D) Dissecting through the capsule, the two fragments have been exposed (asterisks) and are being excised with a burr. (E) Postoperative radiograph demonstrates the extent of bony excision.